What Is an ADF (Automatic Direction Finder)? Home Other Articles ADF: What Is an ADF (Automatic Direction Finder)? 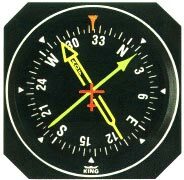 A typical aircraft ADF indicator. Automatic Direction Finder, also called an RBI or Relative Bearing Indicator, is a radio compass which can be tuned to the frequency of a NDB (Non-Directional Beacon) for navigation. The needle of the ADF indicates the relative bearing of the beacon from the aircraft when in range. The ADF antenna system consists of a directional fixed loop aerial plus a non-directional sense aerial to resolve ambiguities. The beacons operate in the low and medium frequency bands of 200 and 415 Khz. The identification of the station is continuously broadcast from the station in Morse code. These signals bounce off the ionosphere giving fairly good reception at low altitudes and long distances from the station (200nm). A disadvantage of these low frequency transmissions is their susceptibility to static caused by lightning.